Q: We want to acquire banks, but the biggest problem we have in our market right now are lack of sellers. Until that changes, how are acquisitions a practical option? It goes against the grain for non-ownership management to choose to sell their banks. In fact, it is far more common for management to resist, even if the investors want to sell. Banks want to avoid the disruption in operations, customers and management, coupled with the occasional stigma that accompanies the divestiture of a bank. Equally importantly, once a bank is up for sale, its eventual disposition (irrespective of final price) is preordained. Bankers want to avoid the uncertainty regarding the bank’s transaction value in the market. Executives have concerns regarding job security. These disincentives can be overcome if an acquirer has a proactive approach and the right analytics. Bankers that use proper analytics can identify targets, determine a reasonable and attractive price, and facilitate a confidential transaction – without the negative attention and exposure drawn by traditional auctions. Q: The asking price for some of these banks appears outrageous. When do you think the valuation expectations of selling banks will come back to earth? A: The term “outrageous price” implies its measurement against a certain standard. The choice of standard (historical book values, multiples, tangible book value dilution etc.) is fraught with danger. That’s where many banks/buyers miss potential opportunities. The post-recession environment, with its drastically changed capital adequacy requirements, low interest rate monetary policy and highly competitive loan demand, remains in flux. You can’t compare it to the pre-recession banking environment. These radical changes demand an equally radical change in the approach to M&A valuation in banking. The same target has substantially diff values based on the potential acquirer’s unique loan mix, risk profile, profitability and capital structure. The same target will also have substantially diff values to you based upon current and anticipated economic conditions and monetary policy. Analyzing publicly available financial data using traditional metrics is extremely misleading in quantifying a potential opportunity. Due diligence techniques based on pre-recession practice cannot accurately evaluate the pro forma implications of the transaction. Historical statistics are meaningless, even when evaluating similar institutions in overlapping geographic This is one of the most common and serious mistakes made in M&A across all industries. Its only value is to an intelligent acquirer who can gain an edge by estimating the competing bidding ranges of the acquirers that rely on historical statistics based on legacy analytics. The bottom line is there is no such thing as an outrageous price. You could be paying an outrageous price, but the same “outrageous price” could be very reasonable for an acquiring bank that has done its homework with the proper analytics. Q: I feel like I know and have talked to most of the other players in my market. In some cases, I think I know them better than they know themselves. How could I possibly still gain some kind of edge with analytics? There is inevitably a personal consideration for the selling management. This consideration cannot be addressed and/or taken seriously by the seller until the potential buyer has indicated a reasonable transaction structure based on the proper pre-due diligence analytics. Every CEO/investor has a mental estimate of the approximate selling value of their bank in the existing marketplace. This estimate is based on a subjective evaluation of recent transactions, investment banker and board member conversations, press articles, etc. This mental evaluation/expectation is generally not conducive to a selling decision. Unfortunately, these “mental evaluations” do a disservice to the CEO’s/ investor’s bank, which could have a substantially higher value to the right buyer. This “mental estimate” that is in the mind of every CEO/investor in the marketplace opens up a unique opportunity for buyers that can identify targets (not officially for sale) that create substantial value for the buyer. In the right situation this “substantial value” could translate into a price discussion that is above the “mental estimate” of the potentially selling CEO/ investor. A surprisingly large number of transactions across a wide range of industries have occurred after such conversations. The confidentiality associated with such potential transactions often leads to subsequent discussions without the negatives associated with auctions. Also keep in mind that ‘shareholder fatigue’ is beginning to accelerate at many of these targets. Many shareholders are feeling the pain of reduced or eliminated dividends over a prolonged period of time, so their patience relative to achieving a return on investment is beginning to wane. Many of the CEOs at these institutions will want to take control of the process if they sense that the sale of the bank is inevitable. You want to be in front of them when that happens, so you want to be talking to them a year early, not a day late. If an investment banker is engaged to manage the sale of the bank via an auction, they are no longer in control and you just become a stalking horse for their investment banker to exploit and drive up the price. Q: I feel like pundits have been predicting a consolidation in the industry for years. Will it ever happen, and if so, what will be the tipping point? The Russell 2000 is a good indicator of the type of equity discrimination (by industry) that is occurring. Given the psychology of the typical community bank investor and their long-term orientation, there remains some comfort that existing investors will not abandon ship. However, the loss of appetite for investment in banking institutions has significance in that it will certainly discourage the entry of new investors into the sector. There is an insidious change going on in the community banking market that is masked by traditional accounting and asset liability management systems and ignored by market analysts and investment This will inevitably change community bank investor perspectives and behavior. The prolonged period of low interest rates has slowly but steadily poisoned bank loan portfolios with ever- increasing percentages of low interest loans created in the post-recession monetary policy. The impact of these low interest loans is to some extent negated by the accompanying low cost of funds, creating complacency that has no business in the community banking market. Pre-recession low interest-rate periods were short in duration with reasonably high interest rate troughs. These fluctuations did not have enough time to impact significant portions of loan portfolios. The prolonged low interest rate environment does not bode well for future earnings, as higher rate and spread loans continue to run off balance sheets. Increased competition for loans and aggressive pricing by banks continues to aggravate the situation. Financial leverage continues to decline in the community banking system as capital adequacy requirements continue to rise. More capital is going to be required support the same amount of assets, assets that have substantially lower earnings power. This trend of increasing capital adequacy requirements shows no sign of abating. In summary, investors will start to see consistently decreasing earnings and a lack of liquidity that will increasingly test their patience. These operating and financial trends are already happening, but they have yet to be recognized due to the limitations of legacy analytics and reporting systems. The rate of transformation of loan portfolios, toward increasing percentages of lower interest rate yield loans, is accelerating at an alarming rate. These issues will rise to the surface once we see a change in the business cycle, likely driven by a change in monetary policy or an economic downturn. Q: We have been thinking about acquisitions, but we are in the process of a core systems conversion and have several other internal projects on the horizon that are tying up resources. What do you think the M&A environment will be like say nine to twelve months from now, when we think we may be ready? A: Every industry in the U.S. has come under financial and operating pressure at some point, resulting in an inevitable decline in investor ROI. The survivors are the institutions that capitalized by consolidating aggressively through acquisition. Early adopters have always survived the downturns and prospered in the recoveries. Institutions that delay, due to timidity or excessive introspection, often disappear from the landscape. This scenario is built into the DNA of capitalism. In banking, the top 20 banks built up their present positions through acquisitions. Many of their peers of the 1990s exist only in history books. This pattern has and will continue to repeat itself. Any business plan in the community banking market will reflect at best, low double-digit growth. Growth in assets means inherently low yields and increasing risk. In the meantime, higher rate loans will continue to run off the bank’s books. Even in the best of circumstances, given the existing operating environment, most banks will be worse off at the end of the year. And to achieve their year-end targets, they will have to deal with the accompanying challenges, stresses and operating costs of running their bank. One small M&A transaction, properly analyzed and structured, can in the space of months result in better earnings and a far more robust yielding asset base than the eventual successful completion of the proposed annual business The opportunity time lost during this year can never be recovered. The odds of the appropriate transaction being available 12 months down the road will continue to decline at a rapid rate. It is very easy for management to delay focusing on a perceived “non-essential” process like M&A while getting the “house in order. ” In most environments this is the essential and fundamental responsibility of management. Unfortunately, economic conditions, monetary policy and the competitive environment have created a slow but steadily burning fire outside the house that has to be addressed as part of a bank strategic planning process. A proactive approach to M&A – which results in the best transactions –already requires patience. There is a courtship and dating period that occurs before there is a wedding. If you are thinking about a transaction 9-12 months from now, you need to start the courtship period now. Q: Do I have to work with an investment banker if I want to acquire banks? They seem to be the ‘connectors’ between buyers and sellers in the market. A: Investment bankers will continue to have a key role in the M&A market. However, it becomes extremely important for the community banker to properly define and compartmentalize the role of the investment banker. From an investment banker’s perspective, advising the seller is the equivalent to a ‘bird in the hand,’ whereas buyers are just birds in the bush. In most situations, buyers are becoming aware of banks for sale through the seller’s investment banker, not their own. Long story short – if you are a buyer and your investment banker is not bringing you deals, then their value to you is more limited and the analytics and deal advisory they bring to the table becomes more of a commodity. About the Expert: Invictus Chairman Kamal Mustafa is the former head of global M&A at Citibank. 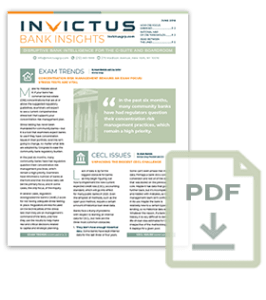 Editor’s Note: Invictus’ forward-looking risk analytics (FLRA®) help its M&A SWAT team to identify potential targets and determine transaction value before banks are even on the market. For more information, contact George Dean Callas at gcallas@invictusgrp.com.